Cast: Sachin Tendulkar, Anjali Tendulkar, Ajit Tendulkar, M S Dhoni. Access is a beautiful thing. But it comes with its set of pros and cons. British filmmaker James Erskine gets a seat on Sachin's private jet which takes the cricketer's boy gang to Goa, a chance to accompany Sachin the coach training his son Arjun in Yorkshire and use footage from the legend's personal home videos. But the film, rather unsurprisingly, is more a paean to India's most beloved sportsman than a comprehensive examination of him. The controversies - the rivalry with Azharuddin, his fallout with friend Vinod Kambli, the failed captaincy, the match fixing scandal - barely get addressed. Instead the film is overloaded with nostalgia and Did-You-Know trivia that keeps viewers sated, and a few scenes which will appease Tendulkar's many sponsors too. Ultimately one walks out knowing little new about the little master. ALSO READ : Sachin Tendulkar : Mumbai Indians showed it's never over till its over. Erskine starts off with a docudrama approach, presenting Sachin the notorious prankster who grew up in a middle class home with his parents and siblings. 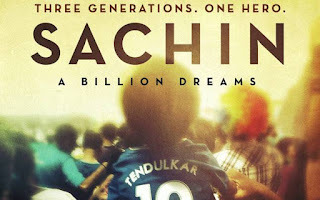 Sachin the origins story appeals the most as Erskine focuses on Sachin's humble background which makes his extraordinary achievement and simplicity even more impressive. We see recreated footage of a child slogging in the nets of Shivaji Park in Dadar for hours; sent away to his relatives' place so that he saves on travel time and a supportive brother in Ajit Tendulkar, a figure so instrumental in the making of Sachin that one wishes there was more about their bond. Added are voices of a few family members recalling one anecdote, the most noteworthy being Sachin's sister, Savita, getting him a bat from Kashmir, and the pivotal role of the demanding coach Ramakant Achrekar. If Erskine compromises on sibling love, it's perhaps because he intends to acknowledge the ultimate sacrifice of his wife Anjali Tendulkar. In an aww-worthy moment, we get a quick retelling of their Jab We Met and how in a major reshuffle of tradition it was Anjali who went to Sachin's house to ask the hand of her boyfriend of four years. The moment that lingers most is not on field but off it when Anjali speaks of how one of them had to give up on their professional dreams and it was she, a practising doctor, who volunteered. It is through Anjali's measured voice viewers will understand the emotional toll - of the losses, the extensive scrutiny and the expectations of a billion people - on Sachin and his family. For most part Sachin: A Billion Dreams runs a highlight reel, revisiting the key milestones of his 24-year-long career. There are many because of the longevity of Tendulkar's sporting career and the many records he set. The lows are documented but emphasis here is more on the defeats suffered at the World Cup rather than the many losses away from home. Also missing is his rapport with his teammates especially the likes of Ganguly, Dravid and Kumble. Instead considerable time is devoted to squeeze in as many voices of international players singing his praises and a few younger players like Virat Kohli emphasising his influence to their game. For cricket fanatics these portions will be rewarding but for many they may be repetitive especially when the film heads towards the send-off. Rahman's score is overshadowed by the Sachin... Sachin... chant which is on loop whenever a moment needs to be heightened. The film has its share of moments especially when Erskine is willing to have a laugh at his hero's expense such as when he plays one of Sachin's favourite tracks (it's by Bappi Lahiri) against the backdrop of Sachin partying with his friends or footage from his wedding video to "Bade Achche Lagte Hai". He also has an eye of what archival footage to pick to draw laughs and make an observation. The film also briefly manages to make viewers reflect on the dark and shameful side of India's fanaticism which holds cricketers accountable to extreme standards. Documentaries about icons made with the support and participation of the subject's family can be informative and insightful. See Asif Kapadia's Senna and Stevan Riley's Listen to Me Marlon which paint a lesser-seen portrait of a renowned figure and steer clear of becoming hagiographies. Sachin: A Billion Dreams just about avoids turning into one because it knows well how to exploit India's biggest obsession - cricket - and its absolute devotion to its biggest icon. One wishes Erskine was a bit more daring and threw more bouncers to the formidable batsman. They may have made him uncomfortable but they would also be revelatory.